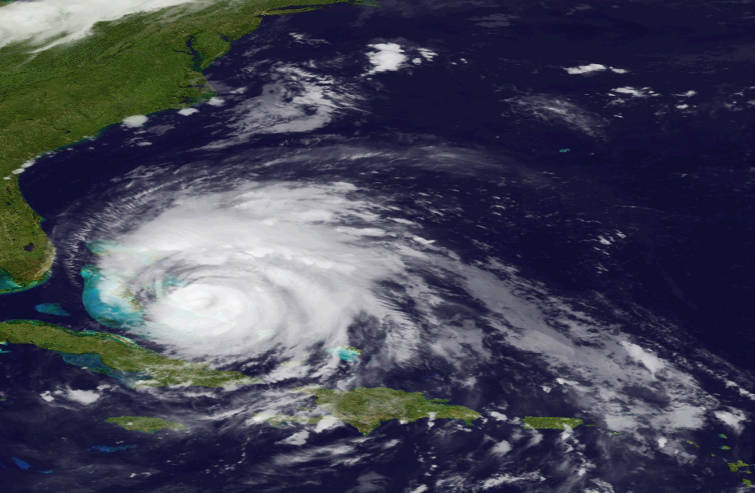 In an image provided by NOAA and made by the GOES East satellite Hurricane Irene is shown as it moves over the Bahamas on Thursday. Irene could hit North Carolina's Outer Banks on Saturday afternoon with winds around 115 mph and it's predicted to go up the East Coast, dumping rain from Virginia to New York City. NASHVILLE - Bags were packed, equipment and vehicles loaded and soldiers and airmen ready to move to Fort Pickett, Va., when more than 2,000 troops from Tennessee were ordered to stand down preparations to assist after Hurricane Irene. "We received the call from National Guard Bureau in Washington at about 5 p.m. on Sunday to stand down operations and recall the advance party already in Virginia," stated Randy Harris, spokesman for the Tennessee Military Department. "Damage from the hurricane was not as extensive as we feared, and that's a good thing," Harris said. "The National Guard motto is, 'Always Ready Always There' and it's good to know that our soldiers and airmen are upholding the tradition of generations of Tennesseans before them. They are true Volunteers ready to respond at a moment's notice."